Ok. I only managed to chase one. But nonetheless, Oregon offers the best and diverse waterfalls in the north west, no doubt. A few friends and I took a weekend trip to casually spend time in Portland on a no prior itinerary plans. But knowing me, I like to plan my routes ahead to get my times worth. Driving down to Oregon was easy enough with traffic and a little bit of a unplanned scenic detour which turned out totally fine because we didn't give any timeframe of arrival. We've all visited Oregon a number of times so it was a laid back trip. We made sure to check out a few highly reviewed places to eat around town. One was 10 Barrel Brewing for a few drinks. They carried a pretty good selection of beers, but the food weren't the greatest, just your typical bar grub. I think the rooftop patio was more of a good catch that most people head there for. They had a patio sit down section and a bar where most people stood around mingling or waiting on a table. It's definitely a great place to hang out with a great vibe, good beer and good music on good warm summer nights. 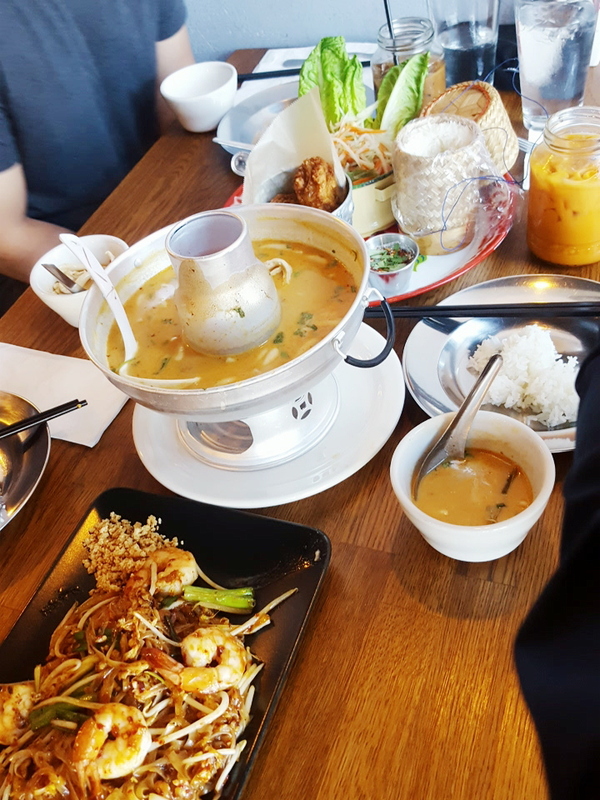 One place that placed our yum factor was Mee Gin Thai Soul Kitchen on Hawthorne Blvd. We craved hard for Thai food; like always. The place was empty when we arrived in the afternoon which was perfect. We got our food at right amount of time and one of the owner was really glad to serve us our dishes and always made sure we were alright with the food. They serve pandan infused water which was nice and refreshing, and served our tom kha gai in a fire pot. And the most we invested our time on (food-wise) was taking a 2 hour drive south to Eugene to Papa's Soul Food Kitchen and BBQ just off at the end of I-105. We did have to wait 30 minutes to get seated because it was pretty packed. The place was a house turned into a restaurant with a homey southern vibe and had a lot of locals. We sat at the patio with the live band of jazz blues which was pleasant. As for the food; it was definitely delicious and filling and had really great cornbread that was included in most meals and it was so good that we all ordered extra sides of them. But to go out of your way for the place arriving to wait extra long was not worth it, however. But if you were driving down south anyway, definitely check it out to get yourself some soul food. 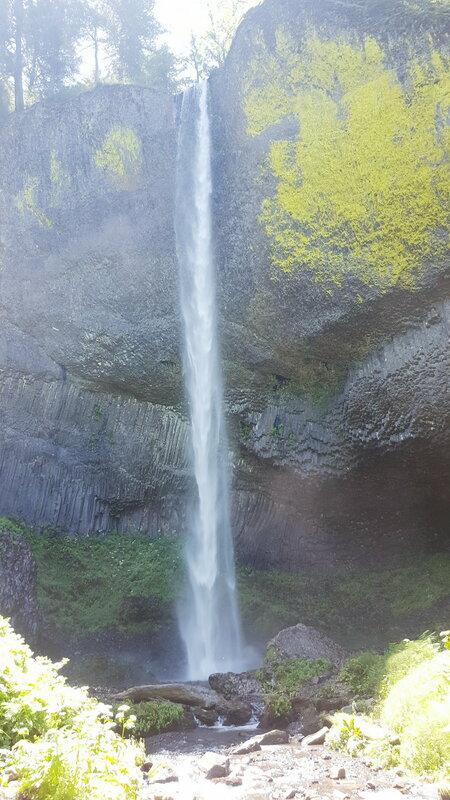 If you head over to Multnomah Falls, check out Latourell Falls which is only about 1 km away. It was the first Falls we wanted to hit since we've all visited Multnomah before. It definitely did not disappoint. It didn't have many parking stalls nearby so you have to park on the side of the road and walk over. Luckily, we didn't have to walk too far. There are a couple hiking trails but we went straight for the falls. If you want to see the falls up close at the bottom, the entrance is just by the side to walk over and not the stairs up. We didn't hike up to the top of the waterfall because we enjoyed everything from below. It was refreshing with all the mist but be very cautious at the bottom with the mud and slippery rocks. And you will get wet. We decided to drive over to Multnomah Falls because it was in close proximity, but once we saw how long the single line traffic was to the fall, we ditched the plan. It's always usually best to visit the tourist attractions in the morning before all the tour buses arrive. That's when they get really packed with tourists. Oregon has one of the best coastal drives in the northwest, so we couldn't pass on your typical Cannon Beach trip. The drive takes about 1.5 hours to the coast. You'll most likely pass through clouds and drizzles on the way through the forest mountains but don't be disheartened, the weather is constantly changing. However, pack a light jacket or a blanket in case you get chilly on cloudy days; the views of the long sandy coast is still spectacular and worth the drive.